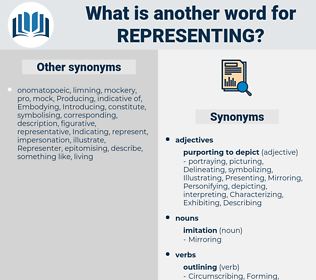 What is another word for representing? delegations, represents, representatives, stands, officers, Faces, representation, representations, represented. presented, constituted, reflected, posed, Consisted, signified, Accounted, attended, Amounted, Argued, ranked, marked, concluded, authorized. 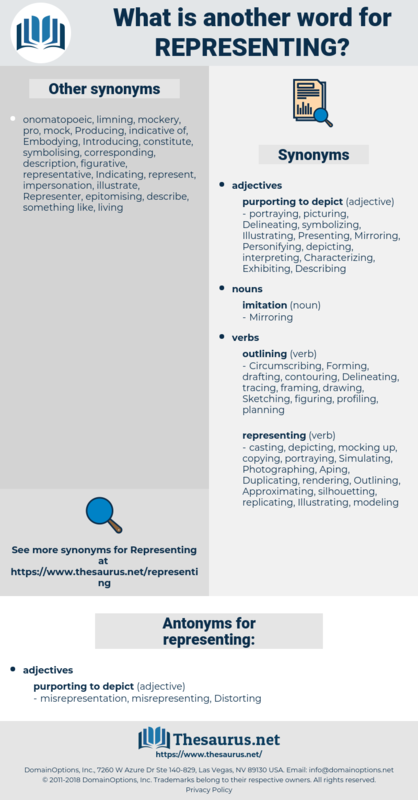 Presenting, Constituting, constitutes, Responding, participating, reflecting, Incorporating, posing, correspond, corresponding, responsible, Generating, demonstrating, Resembling, encompassing, resulting, measurement, Illustrating, Indicating, serving, Pertaining, Guaranteeing, Registering, Suggesting, contributing, Originating, portraying, appearing, Consisting, integrating, steering, Containing, Replying, symbolizing, Signifying, Promoting, Proposing, asserting, stressing, Addressing, Organizations, Denoting, Considering, belonging, Appointing, Relating, Describing, ensuring, Emanating, measuring, Measures, Creating, gathering, Possessing, Expressing, accounting, Entailing, Simulating, Consolidating, Recognizing, standing, Embodying, Relying, attending, Incarnating, symbolising, uniting, recording, regrouping, Outlining, Displaying, conveying, protecting, Involving, operating, Employing, Advocating, writing, exemplifying, i.e., offering, clustering, emphasizing, safeguarding, combining, Occupying, Implying, incurring, Submitting, Amounting, Arising, reaching, performing, namely, conforming, concerning, comparing, Governments, counting, Agencies, Articulating, enrolled, handling, speaking, Forming, satisfying, regarding, regards, Spanning, identifying, Requesting, bearing, Equaling, Equalling, Introducing, bring, bringing, underlying, Attaining, deputising, being, Requiring, affecting, processing, joining, training, Preparing, posting, Producing, total, Totaling, Totalling, arguing, assuring, ranking, Earning, increasing, Establishing, Delivering, assembling, merging, setting, featuring, filing, Providing, Securing, drafting, quantifying, costing, Exposing, Exhibiting, wearing, Depending, purchasing, highlighting, embracing, marking, sensing, Intending, Aiming, matching, Championing, meaning, showcasing, ranging, hence, compiling, rising, fitting, supplying, crossing, enabling, working, advancing, touching, smelling, raising, ladder, leading, Tabling, laying, playing, dealing, Aggregating, holding, saying, voicing, coming, grouping, Stating, leaving, accusing, Achieving, focusing, applied, Having, Placing, Accruing, Alleging, becoming, according, yielding, friend, building, Pooling, caring, selling, putting, Plotting, ec, co, giving, knowing, Claiming, feeling, taking, for, falling, numbering, buying, calling, acting, going, 2001, Doing, name, names, making, getting, representatives, Including. constitute, elect, illustrate, account, amount. As it was, he was the best end that ever played on a football eleven representing Burden High! A fantastic figure representing a serpent's open mouth contained the exhaust pipe. refreshment, represented, rapprochement, rubber cement.